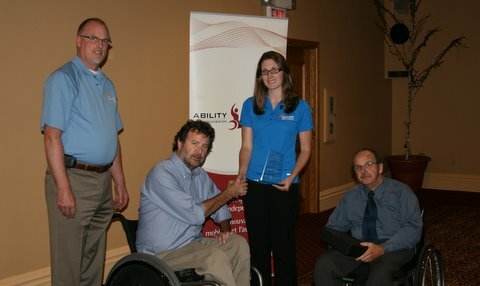 Left to right: Robin Hawkes, Manager, Sales & Marketing; Pat Guest, Ability NB Board member; Lauren Nicholson, Communications Specialist, Enbridge; & Jacques Laroche, Ability NB Board member. Enbridge – We were proud to present our annual Caring Corporate Award to Enbridge. For the past two years, Enbridge has joined our organization as a gold sponsor of our signature event, Feast in the Field. In addition to the sponsorship, Enbridge has gone above and beyond to help support our Feast and golf events through little extas like giveaways, to volunteers at the events. Enbridge employees have an incredible since of generosity and social reponsibility. Enbridge employees Mike McAloon and Bill Leonard have been instrumental board members with great expertise, especially in areas such as our rebranding. Enbridge employeee Frank Bellehumeur has been part of the Feast organizing committee, and always goes above and beyond in helping with our events whether it’s barbecuing hot dogs for the golf event, or securing exhibitors, providing harvest decorations or hauling supplies for our Feast event. Enbridge is also a proactive United Way partner, and as a United Way agency, Ability NB benefits from Dave Charleson’s leadership on the United Way Board of Directors and the Enbridge contributions to the United Way campaign.